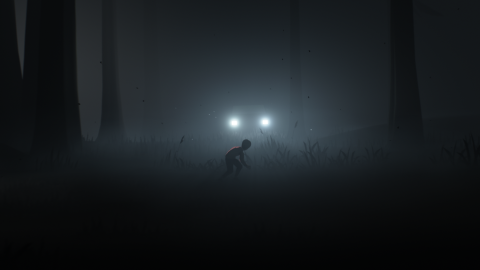 The brutal, beautiful spiritual successor to Limbo. What is it? A minimalist, atmospheric puzzle-platformer. A child is hunted through a shadowy forest by masked men. He snags his foot on a branch and falls over, and one of the figures lunges at him, pins him to the ground, and chokes him to death. In another moment the child stumbles into the headlights of a truck and a masked man guns him down with a rifle. Later he’s chased by a pack of snarling dogs who tear him apart in a vicious frenzy. Inside, the new game from Limbo developer Playdead, is full of these moments of shocking, indifferent, and slightly perverse violence. Even though you know dying means being spirited back to a generously placed checkpoint, the brutality you’re forced to watch when you fail gives your mistakes extra weight. And the fact you’re playing as a young boy, who’s clearly in distress, only heightens how savage it is. Like Limbo, you’re locked to a 2D plane. You don’t know who the boy is or why he’s being chased by these men, but the side-scrolling perspective urges you to head right and keep heading right until the credits roll. It’s a five-hour journey that involves some platforming, a lot of puzzle-solving, and a final act that’s one of the most bizarre things I’ve ever experienced in a game. But I won’t say anything more about that. It’s a secret worth keeping. The story is told without text or dialogue, and has a hazy, dreamlike quality that leaves much of it open to interpretation. But while there’s probably an explanation, or at least a good theory, about what happens, it’s ultimately unimportant. An answer is rarely as interesting as a question, and the game’s weird, abstract tone benefits from the story being enigmatic. By the time the credits appeared I still didn’t know who the boy was or why he was being chased. In fact, I was left with more questions, some of which I doubt will ever be answered. But I didn’t mind, because it was such a surreal, surprising journey. The stark minimalism of the narrative is reflected in the stylish visual design. A muted colour palette and careful use of shadow and silhouette give the boy’s surroundings a looming, ominous feel. He’s often the smallest thing on the screen, a fragile spot of red against a dark mass, which adds to the feeling of being lost and hunted. The lighting is beautiful too, from the intimidating spotlights of mechanical sentries to flashlight beams slicing through trees as you’re being chased by those masked men. Some scenes don’t have as much personality as others—an extended underwater section notably lacks variety, and goes on far too long—but overall Inside is a remarkable piece of visual art. The boy is wonderfully animated too, with a weighty momentum to his running, jumping, and scrambling that’s complemented by precise, responsive controls. There are only two buttons—jump and grab—which neatly unifies the environmental puzzles you encounter. Some involve shoving crates and swinging on chains, while others see you using a device to control the minds of drone-like workers. Some of these are brilliantly designed, with elegant solutions that do the Portal thing of making you feel, momentarily, like a genius. Repetition is an issue, however, despite the relatively short running time. A lot of puzzles are reused with only slight variations, and get less satisfying each time you solve them. And you’ll find yourself attempting some set-pieces several times to figure out the precise timing and sequence of jumps to avoid a gauntlet of obstacles. Making mistakes and watching a child being repeatedly strangled, blown up, eaten, and drowned feels at odds with the game’s otherwise haunting, ethereal atmosphere. I also found it to be an oddly cold, detached experience, with no trace of warmth or pathos to break up the gloom. This might have been the idea—and it’s a valid artistic choice—but for me it made my journey feel slightly aimless and arbitrary. I didn’t get the sense that I had any motivation besides reaching the end, which made the whole thing feel emotionally hollow. You might get something else out of it and interpret the story differently, but I felt no meaningful attachment to the boy or his plight, whatever it was. Inside is a strange, beautiful game, but one I found it difficult to love. The otherworldly atmosphere, striking visuals, and understated storytelling are among its greatest strengths. But in terms of actual game design, it only has a handful of ideas and spreads them too thinly across its five hours. And when it was over, because traps, ambushes, and surprises are such a crucial part of its design, I felt no urge to return. I’m glad it exists, though, and I enjoyed the time I spent in that world. I just wish it resonated with me more deeply.